A Jewish soldier, suckling on rue in the Kaiser’s army, writes an anti-war poem. From the dust jacket of Ernst Toller’s autobiography, published by William Morrow & Company, New York, New York, 1934. Go dumb to the fight. From Toller, Ernst, Das Schwalbenbuch p. 8 (Berlin und Weimar: Aufbau-Verlag), 1990. Translated from German by Peter C. Appelbaum and James W. Scott. *As it first appeared in Die Aktion, Wochenschrift für Politik, Literatur und Kunst, Franz Pfemfert, ed. May 6, 1918, the poem included the second stanza (in brackets) which was omitted from subsequent publications. But not all the soldiers who fought in that war were buried under crosses. Among the least-remembered fighters are the Jewish soldiers on the German side. 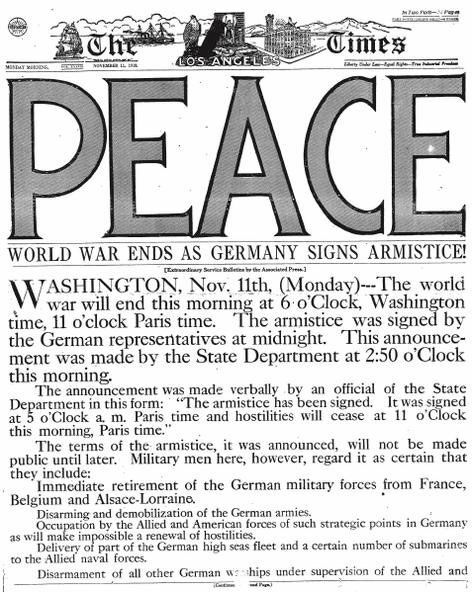 November 11, 1918. The front page of the Los Angeles Times. The translator of Toller's poem, retired pathologist Peter C. Appelbaum has published two books on German Jewish military history, and, together with James W. Scott, a professor emeritus of German, an edition of translations into English of works by German Jewish poet, writer and journalist Kurt Tucholsky, who fought in World War I. (Tucholsky's books were burned almost 20 years to the day after the armistice, on Kristallnacht, (9-10 November, 1938). Appelbaum and Scott are now working on an anthology of German Jewish poets from the war period. Among them is Ernst Toller. Born in 1893 in a Prussian town, Toller patriotically left his studies in France to fight in the German army. Disabused of his enthusiasm by the reality of battle, as this poem indicates, after the war he served for six days in 1919 as president of the very short-lived Bavarian Soviet Republic -- a revolutionary enterprise for which he spent five years in prison, constructively spent in writing. Toller left Germany upon the rise of the Nazis. Following word that his brother and sister had been taken to concentration camps, he committed suicide in New York in May 1939. His last play, “Pastor Hall,” is based on anti-Nazi German cleric Martin Niemoller, whose poem beginning, “First they came for the Communists / And I did not speak out because I was not a Communist” is often cited in debates about the lessons to be learned from the Holocaust and other moral issues. *Musing: Why did Toller later choose to omit the second stanza?